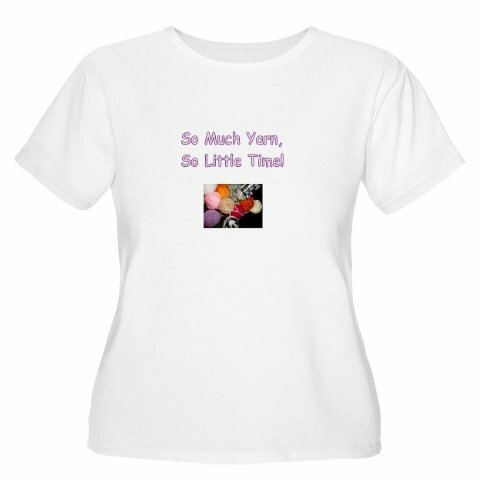 some crochet themed shirts that you may be interested in. She’s working on some additional designs so stay tuned. Im trying to make your free pattern for the tiny bat. about 4" big. I made the first row, then I am stuck on the second row. Im not sure what you are talking about in the pattern. can you help? For Row 1 you chain 20. Then work a single crochet in the second chain from the hook. Then you work two half double crochets, one picot and two more half double crochet ALL in the next chain. Double crochet in the next two chains. Picot in the next chain. Single crochet in the next chain. Skip the next five chains. Work two half double crochets, one picot and two more half double crochet ALL in the next chain. Single crochet in the last chain. Now you work across the top of the wings in the unworked loops of the foundation chain. NOTE: this is the other side of each of the chains you just worked into. Single crochet in each stitch and in the chain 5 space (into the hole below the five chains). Chain 3, work 7 half double crochets in the third chain from the hook. Fasten off leaving about six inches of yarn. Using a yarn needle you sew the head to the wings in the single crochet you made in the chain 5 space on Row 1. I am a new crocheting gal & have spent more time trying to get the knots out of my yarn. I don't think it matters alot unless it's a large skein. Smaller skeins don't seem to tangle as much when the center is used. I don't normally wind my skeins into a ball until I've used around half of the skein. Then I do it only because it seems quicker when I'm crocheting if the yarn comes off of the ball instead out of an unruly skein. Always wind the yarn into the ball loosely so you don't stretch the yarn. No matter what... knots are not fun. The best advice I can give you for knots is do not pull on the yarn alot when trying to remove them. That way you don't get as frustrated. When I first started crocheting I would pull the yarn too taut and the knots were so tight that I would end up frustrated and cut the yarn. When I became more relaxed about getting knots out I rarely have to cut my yarn anymore. Blessed be the God and Father of our Lord Jesus Christ, the Father of mercies and God of all comfort; who comforts us in all our affliction so that we may be able to comfort those who are in any affliction with the comfort with which we ourselves are comforted by God. For just as the sufferings of Christ are ours in abundance, so also our comfort is abundant through Christ. But if we are afflicted, it is for your comfort and salvation; or if we are comforted, it is for your comfort, which is effective in the patient enduring of the same sufferings which we also suffer; and our hope for you is firmly grounded, knowing that as you are sharers of our sufferings, so also you are sharers of our comfort. For we do not want you to be unaware, brethren, of our affliction which came to us in Asia, that we were burdened excessively, beyond our strength, so that we despaired even of life; indeed, we had the sentence of death within ourselves in order that we should not trust in ourselves, but in God who raises the dead; who delivered us from so great a peril of death, and will deliver us, He on whom we have set our hope. And He will yet deliver us, you also joining in helping us through your prayers, that thanks may be given by many persons on our behalf for the favor bestowed upon us through the prayers of many. This quote is from Our Daily Bread - March, 2009 Issue. Which two brothers were known as "the keeper of flocks" and "tiller of the ground"? except... it is worked in a stitch on a row below the normal working row. Never substitute yarns based on how many plies are in them. You can have a four ply yarn that is a worsted weight yarn or a two ply yarn that is considered bulky weight. Substituting yarns based only on the number of plies could cause major problems with your pattern. Always check the gauge and hook size, especially if you're making a garment. do you have number 67? I know your daughter will treasure her special afghan! First of all I must say that this is the most wonderful website. 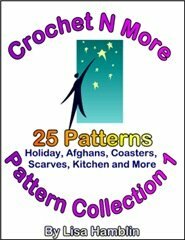 I look forward to receiving my newsletter and finding the new patterns that you share. The praises that you give to God lift me up as well, and I've especially needed those lately while looking after my 82-year-old Mom who has been diagnosed with Parkinson Disease with Dementia. I just want to thank you for a great webpage. I am from Denmark and had found this lovely pattern on the internet but it was American. I haven’t crochet much and I didn’t know the American abbreviations. I would never have finished it without your webpage. Nice job. Hey there! as usual, awesome newsletter and awesome site. thank you! I love your site--it is so complete & helpful. I especially like the way you added your testimony. Not a crochet subject, but needs to be heard. Thank you for sharing! I am almost a beginner can you tell me what these mean. 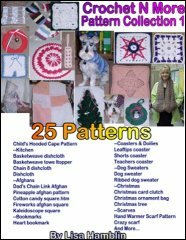 I am trying to make new things for a Farmers Market where I live, I would really like to try your pattern. Thanks and I hope to hear from you soon. 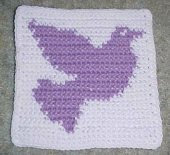 my question is did you do the whole afghan in butterflies or did you do some squares in solids? like to do different blankets according to the yarn I accumulate. That's the beauty of the row count afghan square patterns I have designed. These can all be used in conjunction with each other because they are the same size. You can mix and match any of the squares and/or work solid squares as fillers if you want too. The runner I made only took one skein of Red Heart Super Saver ( 7 ounces ), but my table isn't very large (seats 4 people). The length of the runner is your choice so the amount of yarn will vary depending on that as well as your crochet tension. 1. Using a spare ball of the type of yarn you want to use for your runner, weigh out one ounce of yarn (you can do this using a food scale). 2. Now make a swatch working the pattern until that ounce of yarn is used. 3. Measure the length of the swatch. In order to make the table runner 180 centimeters ... you will need 2.14 skeins to finish the project, so you need to purchase 3 skeins. I hope I've explained this in a way that isn't too confusing. Love the patterns.....Hope you can help me, PLEASE. I am looking for patterns for crochet button covers, hopefully the older ones. My friend does mending for two theatre groups, and I would love to help her and make some buttons for her to use. She has a big heart, and doesn't even charge for her work. Hope someone has some patterns, or could lead me to a few sources. I got your link a while back when I asked about the dog sweater. I had no problem making it as it turned out perfect. My dog, Gizmo does not like you to put any kind of clothing on him. He really gets upset when you take his legs and try to put them in a T-Shirt or sweater, he will bite me. This sweater was great because it was easy to get his legs in, even though he snarls at me he has yet to bite. I have to take it off backwards not over the head. I take his head out of the neck part and then gently pull it off from the back and tell him to move, it works.. I would love to see a dog pattern where you velcro the neck part around the neck and velcrco a strap around the belly. He had a coat like that and he didn't mind that one but he got too fat and now its too small. However I do now have a problem and hope you can help on the sweater pattern I made. The more days my dog who is a shizsu wore the sweater the bigger it got. Now the sweater is too big for him. Now what do I do to make it fit? After I wash it fits but after a few days of wear it stretches out again. I used the yarn suggested also. I'm glad the dog sweater pattern worked up well for you. Yarns do tend to stretch and I remember the first sweater I made would "droop" around the waist area after our dog had worn it a while too. For a "quick fix" you could add a draw string through the waist row to cinch it up... but that would involve tying it and strings left to hang. Not sure how beneficial that would be. For a long term solution you could sew elastic into the waist area. You can fold up the bottom of the sweater enough to make a "casing" to hold the elastic and thread it through... or simply cut the desired length of elastic and weave it through then overlap and sew the ends together. Our first dog also had a jacket... looked like a jogging suit jacket with a hood and everything. It snapped up and also had velcro around the waist area. I loved that little jacket on him. As for using velcro... that's not a good idea with yarn. The velcro is a definite possibility for any use but in yarn related items. It sticks extremely well to yarn fibers but doesn't separate from them easily... leaving the yarn fuzzy looking. I will add a new dog sweater to my future design ideas list.... maybe I can come up with a good design that has buttons or some other type of closure. I have a pattern for the Easter hotpad and I ch 20 and sc in each st for row 1. Row 2 I turn and ch 1 and sc in same st...???? Can you explain this as usually after you ch1 you sc in next st..... or is that sc in same st the same thing? Once you chain 1 you work into the very first stitch. Everytime I do this the hotpad gets wider and wider, so what am I doing wrong? It shouldn't get wider... make sure you are only placing one stitch in each stitch. Are you using three strands of yarn at once? It could just be your tension... all crocheters crochet at different "tensions", meaning that the crochet stitches can be tighter or looser than another crocheter's stitches. You can adjust your hook size to help you achieve the correct size. However, with the Easter Hotpad... as long as it's large enough to set your pan on the size is ok. Here's the pattern... let me explain it. R1: Holding one strand of each color together throughout the pattern. This means you work with three strands of yarn at once for the entire pattern. Chain 20 and work a single crochet in the second chain from the hook. Now work a single crochet in each remaining chain. You should have 19 singles when you finish R1. R2: Ch1, turn. Sc in same st. *Lsc in next st one row below. Sc in next st. Rep from * across. This means you chain 1 and turn. Now single crochet in the same stitch (this is the first stitch). Now repeat from the asterisk across the row. R3: Ch1, turn. Sc in next 2 sts. * Lsc in next st one row below. Sc in next st. Rep from * across to last 2sts. Sc in last 2 sts. Chain 1 and turn. Single crochet in the next two stitches. *Work a long single crochet in the next stitch. Rep Rows 2 & 3, until desired size... ending with R2. Repeat rows 2 and 3 until you get the size you want... ending with Row 2. Do not turn. Sl st in ea row end and st down side, across bottom and up other side. Join with sl st in first sc made on the last row. single crochet you made on the last row. Fasten off. I have checked the links and for some reason the I omitted the extension on the url. Never thought to use that for a baby afghan... that's such a good idea. I'd love to see a picture if you would like to share one. Got a baby shower coming up? Want to give that special baby girl a handmade gift ? 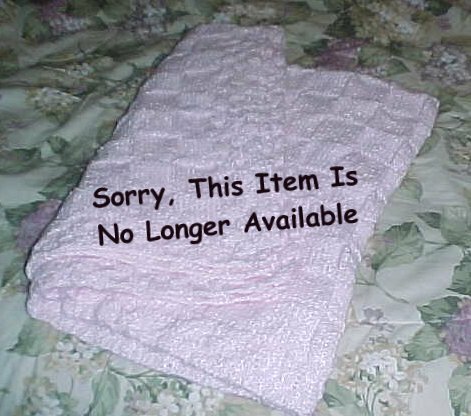 Purchase this knitted basketweave baby afghan! It's large enough to be used even when the baby becomes a toddler ! "Danger! Beware of Dog" posted on the glass door. The stranger couldn't help but be amused. "That certainly doesn't look like a dangerous dog to me. Why in the world would you post that sign?" With only two tellers working at the bank, the line I was standing in was moving very slowly. As I waited, I began to fill in my withdrawal slip. Not sure of the date, I turned and asked the woman behind me. "It's the fifth," she replied. A man from the back of the line advised, "Don't write it in yet!" What do you do if a goober throws a grenade at you? A city boy moved to the country and bought a mule from an old farmer for $100.00. The next day, the farmer drove up and said, "Sorry, but I have some bad news. The mule died." "What ya gonna do with him?" "Sure I can. Watch me. I just won't tell anybody he's dead." A month later the farmer met up with the city boy and asked, "Whatever happened with that dead mule?" "I raffled him off. I sold a hundred tickets at two dollars apiece and made ninety-eight dollar profit. "Just the guy who won. So I gave him his two dollars back". Yes, I'm afraid so," the doctor told her. There was a moment of silence before the senior lady replied, "I'm wondering, then, just how serious is my condition. This prescription is marked "NO REFILLS!" My 50-something friend Nancy and I decided to introduce her mother to the magic of the Internet. Our first move was to access the popular "Ask Jeeves" site, and we told her it could answer any question she had. Nancy's mother was very skeptical until Nancy said, "It's true, Mom. Think of something to ask it." As I sat with fingers poised over the keyboard, Nancy's mother thought a minute, then responded, "How is Aunt Helen feeling?" Two guys inherit the family ranch. One is pretty smart and the other is a goober. "When I get there, if I decide to buy the bull, I'll contact you to drive out and haul it home." He arrives at the man's ranch, inspects the bull, and decides he wants to buy it. After paying him, he drives to the nearest town to send his brother a telegram to tell him the news. He walks into the telegraph office, and says, "I want to send a telegram to my brother telling him that I've bought a bull for our ranch. I need him to hitch the trailer to our pickup truck and drive out here so we can haul it home." The telegraph operator explains that he'll be glad to help him, then adds, "It's just 99 cents a word." Well, after paying for the bull, the guy only has $1 left. He realizes that he'll only be able to send his brother one word. After thinking for a few minutes, he nods, and says, "I want you to send him the word "comfortable." 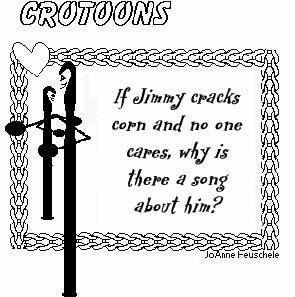 The telegraph operator shakes his head. "How is he ever going to know that you want him to hitch the trailer to your pickup truck and drive out here to haul that bull back to your ranch if you send him the word, 'comfortable?'" The smart guy explains, "My brother's a goober. The word's big. He'll read it slowly. . . Whenever my aunt went to the doctor, she would complain to me about the long delay she always endured. One day, when my aunt's name was finally called, she was asked to step on the scale. "I need to get your weight today," said the nurse. Without a moment's hesitation, my aunt replied, "One hour and 45 minutes!" Feeling their respective faces again, she observed, "God's getting better at it, isn't he ?" A guy shows up late for work. The boss yells "You should have been here at 8:30!"